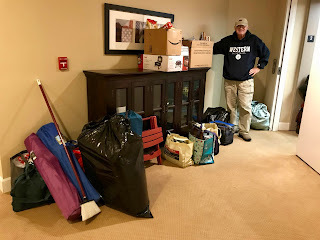 Monday, January 28 -- We left our site at Armitage County Park by 8:30 am. 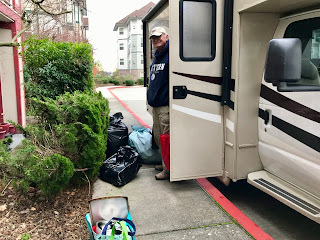 Traveling in an RV makes packing up much quicker than when we tent camp. Wayne unplugs our power, water, and cable TV. 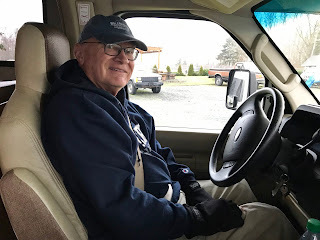 I make sure everything in the RV is secure for road travel. 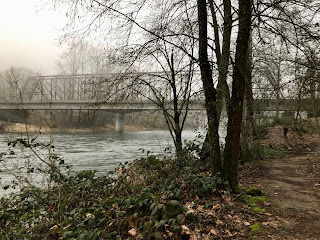 We had fog all the way through Oregon. We've been eating sweet rolls and orange juice on the road rather than cooking something on long travel days. Our goal is to get to Southern California during this period of mild weather, and we'll make it unless something unexpected happens. 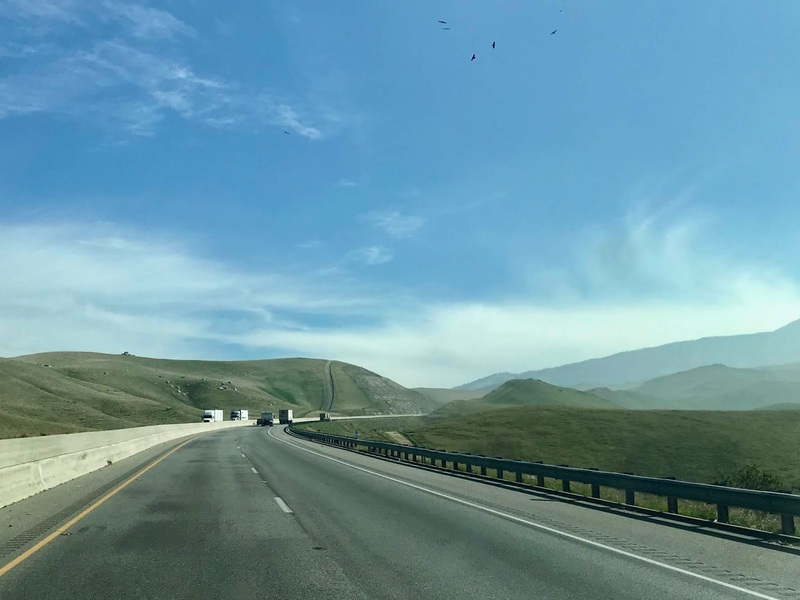 I-5 is a good choice if you want to get to Southern California as quick as possible. It has four or more lanes all the way. Even through it's a thoroughfare, the scenery is beautiful. Over the pass to California with Mt. Shasta to greet us. We drove another 375 miles today. Fog continued until we stopped in Ashland, Oregon for gas. but the visibility was okay for driving. Using two legs of about 185 miles each seems to work for our bums in the seats and the need to use restroom facilities. 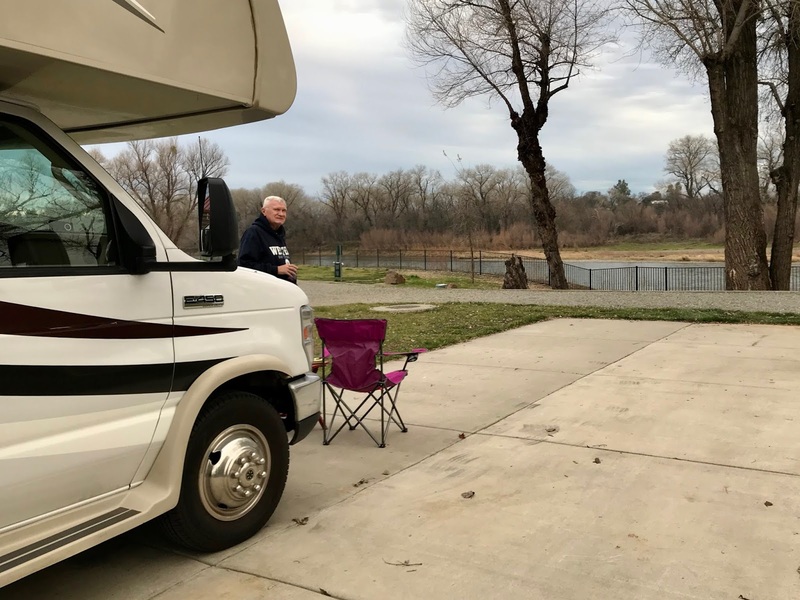 Our Sacramento River site at the Durango RV Resort. 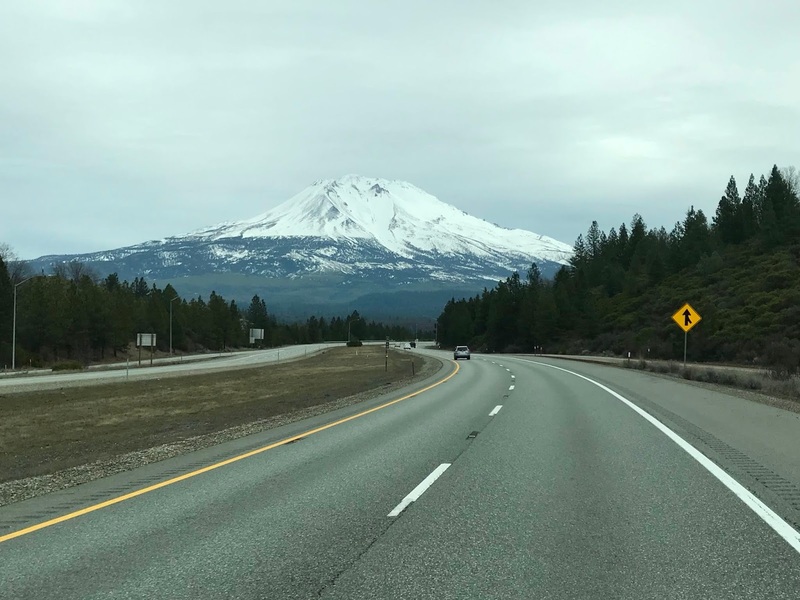 We picked Red Bluff, California, as our destination. 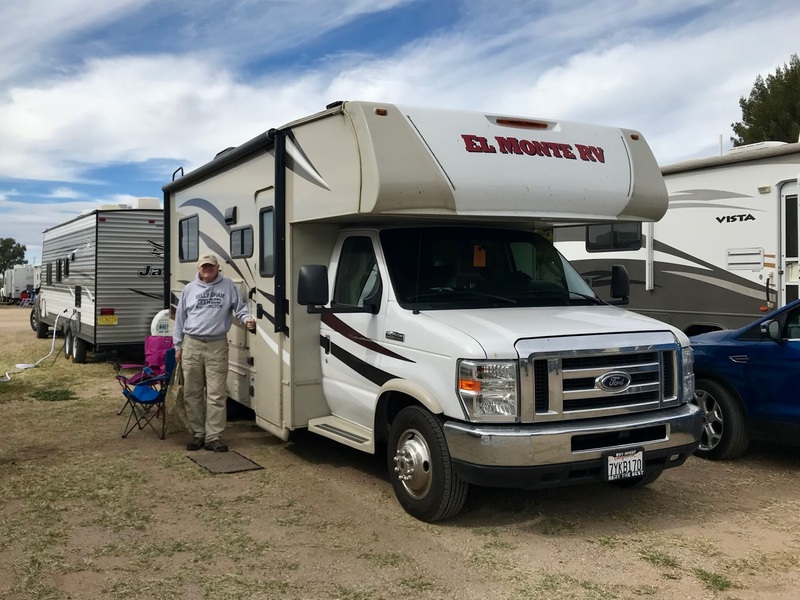 I used the Allstays app to select the Durango RV Resort because of it's amenities, location and nearby shopping. We splurged on a Sacramento River waterfront site. As a treat, we walked to Shari's restaurant for an early dinner. When we got back, there were high clouds. Even so, it was warm enough to sit outside until sunset and enjoy our river view. 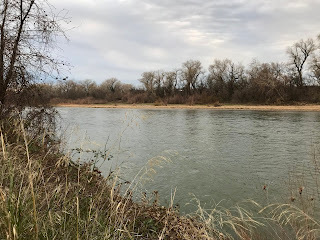 The mighty Sacramento River heading south. 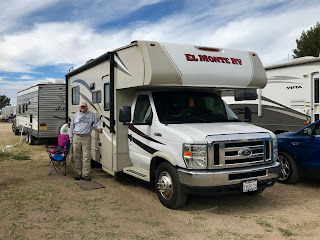 RV Bedroom -- I thought I would share something about our El Monte RV rental. We picked their 22-foot Coachman Leprechaun because it is small, easy to handle and park, and has the bed on the main floor. 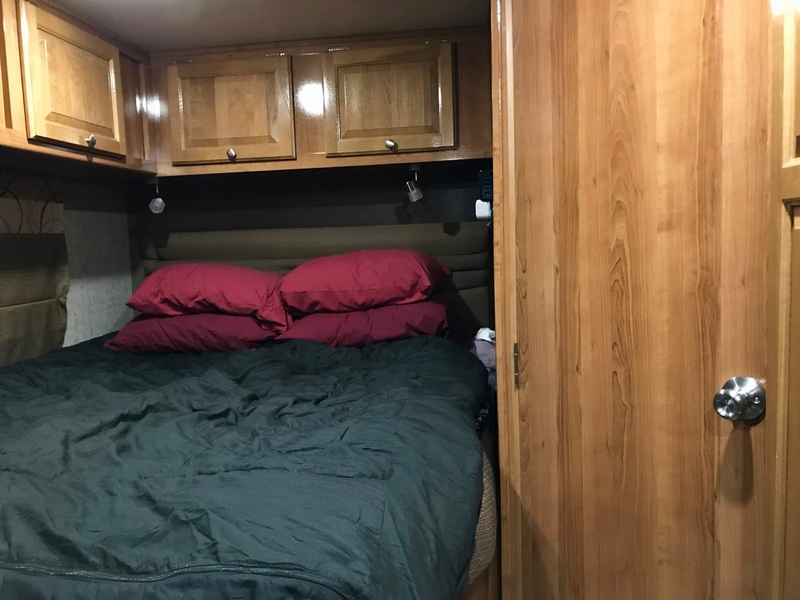 It's queen-size and there's plenty of storage overhead for clothes and things you would need at night. The propane heater keeps us warm all night. The door on the right goes into the small bathroom. I'll show you more about that tomorrow. 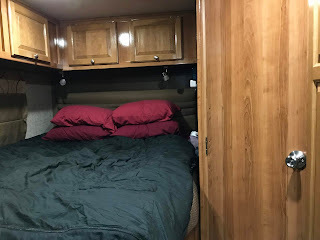 Our bedroom area at the back of the RV. 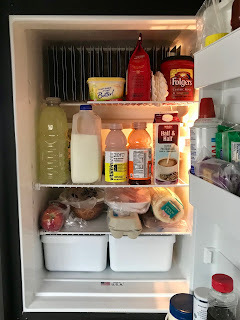 Tuesday, January 29 -- We were up by 8:00 without an alarm. Increased traffic on nearby I-5 probably helped, but it didn't bother our sleep during the night. We pulled out of the Durango RV Resort by 8:30 ready for another long day of driving to reach Arizona before the rain. I-5's four lane divided roadway is good for long distance traveling. We didn't gas up last night, so we drove south to Arbuckle. I pick stations in rural areas that have an easy off and back on. 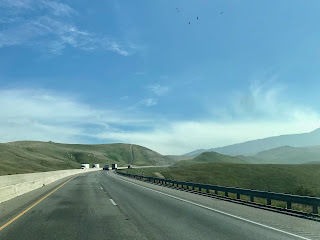 Below Sacramento I-5 runs near the Coast Range foothills. 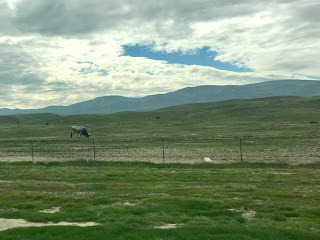 We wanted to drive south from Sacramento to Bakersfield on Highway 99. It's more picturesque with farms and towns. 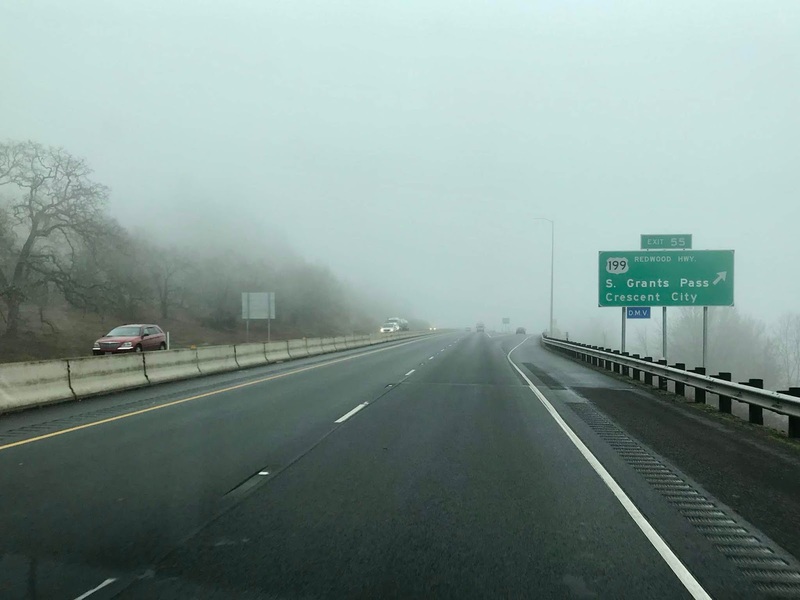 Today there was a dense fog advisory in the Central Valley, so we continued on I-5. 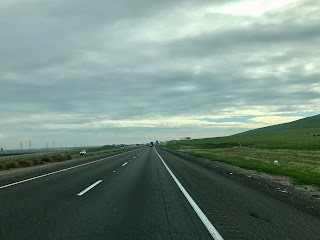 Highway 99 brings back lots of good memories for me. My parents and I traveled it four times a year to visit my grandparents in Waterford, just outside of Modesto. Waterford's changed a lot. Back in my teens, I rode my horse to town on weekends, cruising country style. Harris Ranch has gas, a steakhouse, airport and hotel. 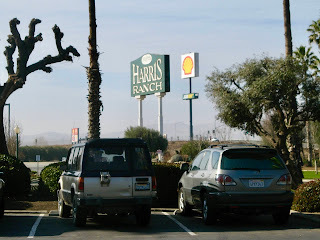 We stopped at Harris Ranch for more gas. It's a popular spot for travelers on I-5. When we lived in Pomona, we liked to fly our Arrow 997, land on their runway, park the plane next to the gate, and walk into the restaurant for a steak dinner (they raise their own beef). Sometimes we would spend the night at the Harris Ranch Inn. 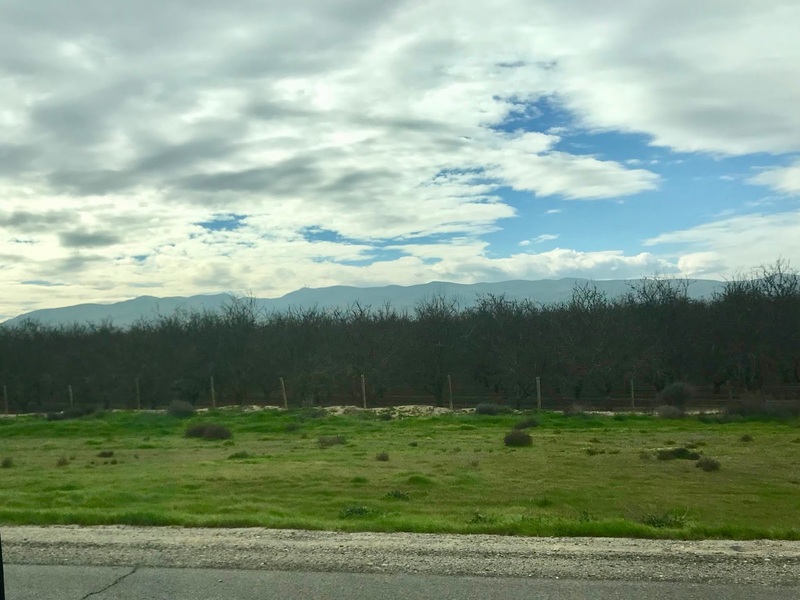 Crops along I-5 include olives, almonds and pistachio nuts. 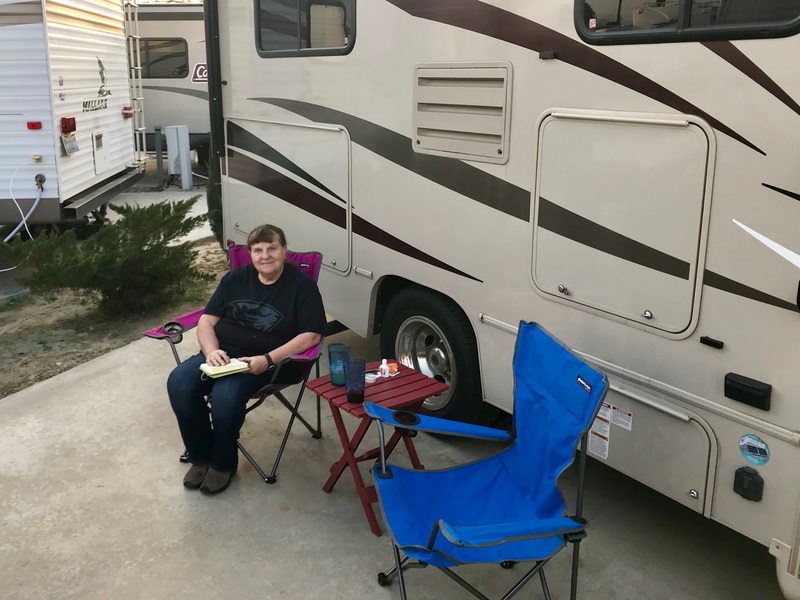 I used the Allstays app again to select our RV park for the night. We considered the River Run RV Park in Bakersfield. 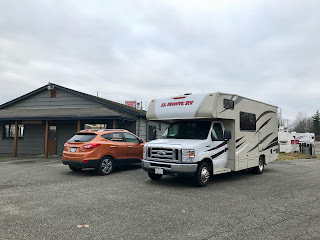 Then I found the Orange Grove RV Park just outside of town in Edison. 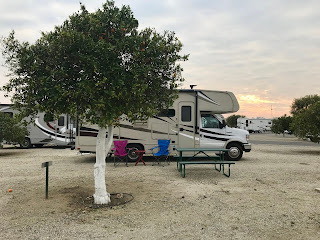 Our Orange Grove RV Park site with its own orange tree. The park is inside a former orange grove with trees at each site loaded with fruit (in season). We got a pull-through with full services for $50 with our Good Sam Club discount. After 434 miles of driving, we relaxed with a cool drink while watching another gorgeous sunset. 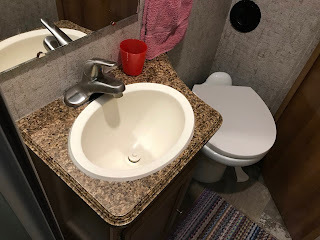 RV Bathroom Facilities -- Yesterday I promised to share our bathroom. 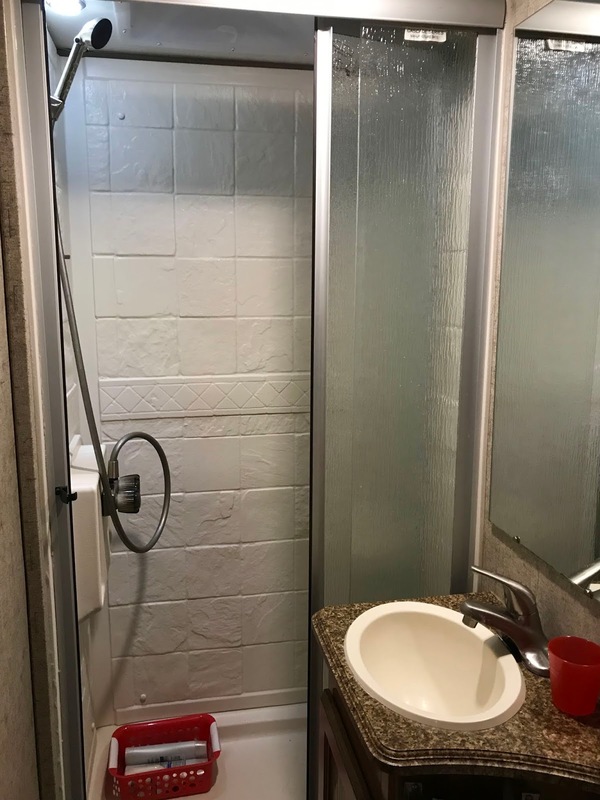 There's a standup shower, sink, flush toilet, and two small storage cabinets. The small shower and sink. It's sized for one, but has everything we need. 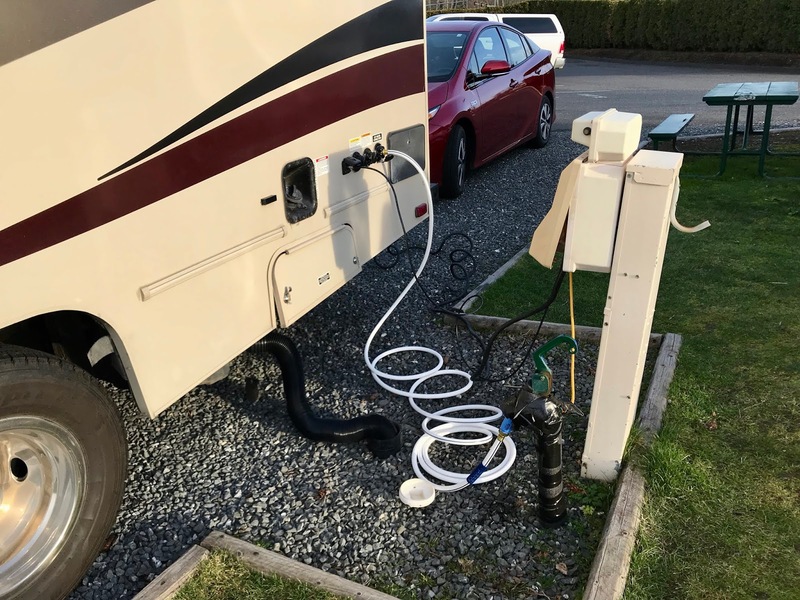 There's a propane hot water heater and fresh water either from our tank or a hookup to city water in RV parks. The flush toilet tucked in the corner. How does the cost of RV rental compare to staying in hotels? 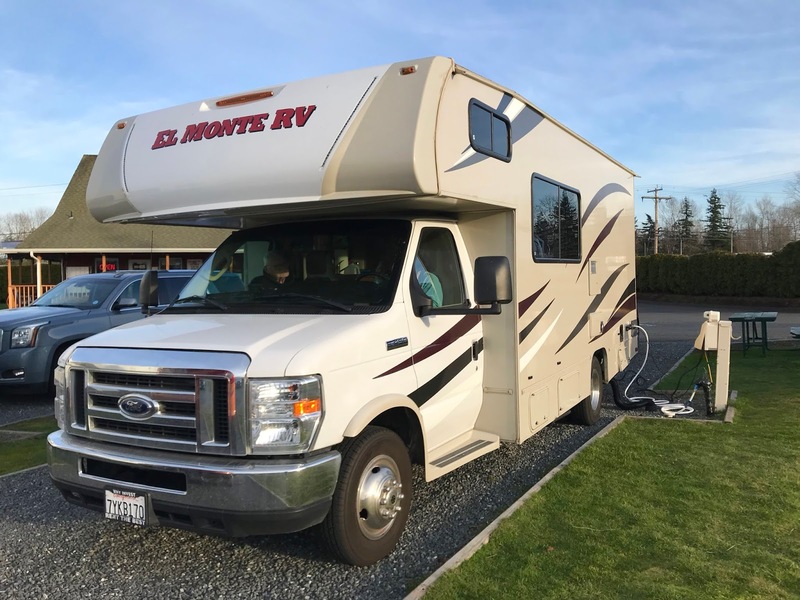 Yesterday Eileen asked about comparing the cost of RV rental to hotel travel. I would say it costs about the same or a little less. 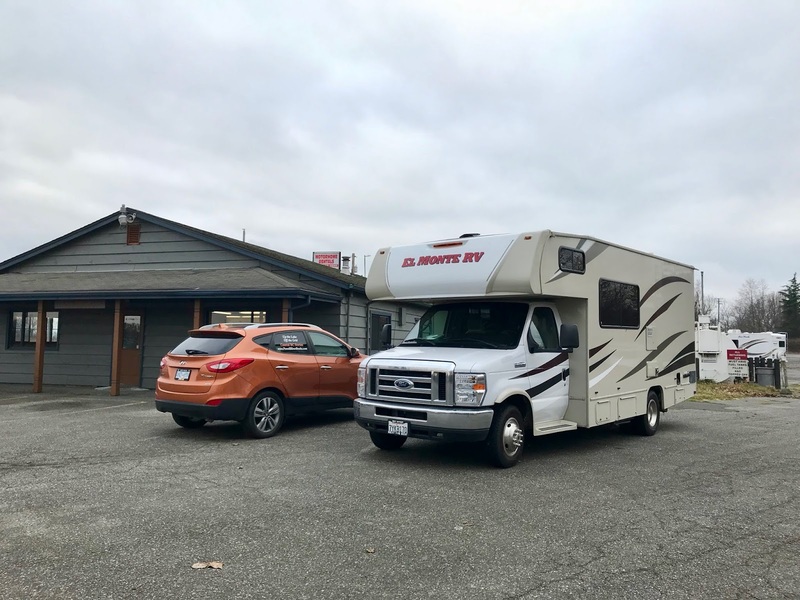 In addition to the rental cost (plus pre-paid mileage fees), you have to consider gas, propane refills if needed, park or campground fees, and food. 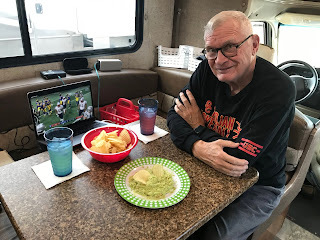 I would estimate the cost for this twenty-five day RV trip will be about the same or a little more than our normal week-long trip to Arizona by airline, staying in a hotel, and eating in restaurants. Plus, with an RV we have the flexibility to go where we want and see the country along the way. Priceless! 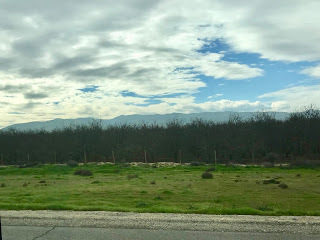 Wednesday, January 30 -- We left the Orange Grove RV Park later than normal. 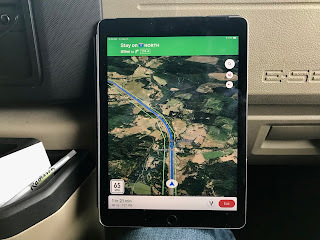 Today we only had 160 miles to drive, that's less than our typical leg between gas stops. We used the extra time to have breakfast, then we emptied our black and gray water holding tanks. You can read more about that below. The rolling hills of Highway 58 leaving the Central Valley. 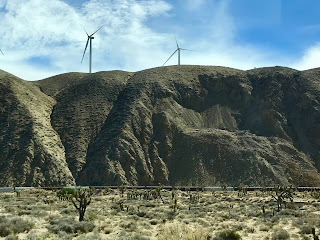 Our route today took us through Tehachapi, Mojave (with it's Air and Space Port), Rosamond (where Wayne's Air National Guard base's C-130s did practice cargo drops), Lancaster, Palmdale, then east on the Pearblossom Highway to familiar Southern California freeways, I-15, I-215, and I-10. 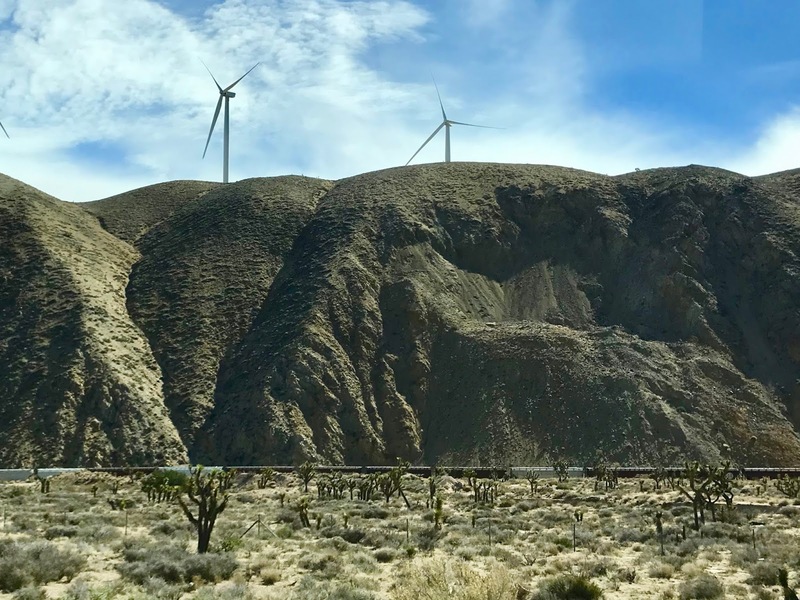 A train, wind generators and Joshua Trees past Tehachapi. 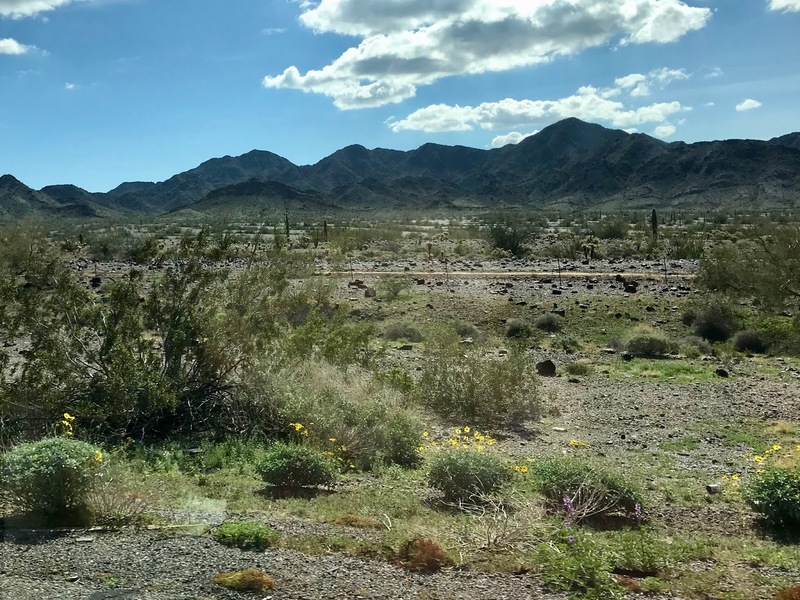 The desert is already dry and brown even though there's been more rain this year with El Niño conditions. 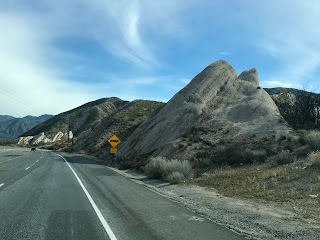 Towards the Mojave Desert there were some very interesting exposed rock formations with uplift caused by earthquakes on the Garlock Fault. Uplifted rocks on the Garlock Fault descending towards Mojave. 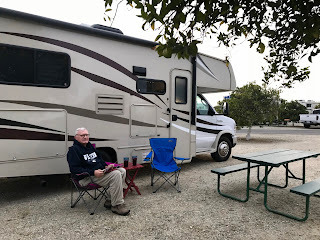 Before we left Orange Grove I called the Mission RV Park in Redlands, California, to see if they had space for us for two nights. Rain is forecast to arrive tomorrow afternoon and last into that night. We picked this park because it's in walking distance to stores and restaurants. If we get bored we can go out for a meal or do some shopping. Right after we arrived we went next door to Cha Cha's Tacos for Mexican food. There's nothing like authentic choices in Southern California. In the Pacific Northwest, many of the restaurants have Americanized their recipes. I had a chili rellano and Wayne had fish tacos. The plan is to return for hueves rancheros for breakfast. 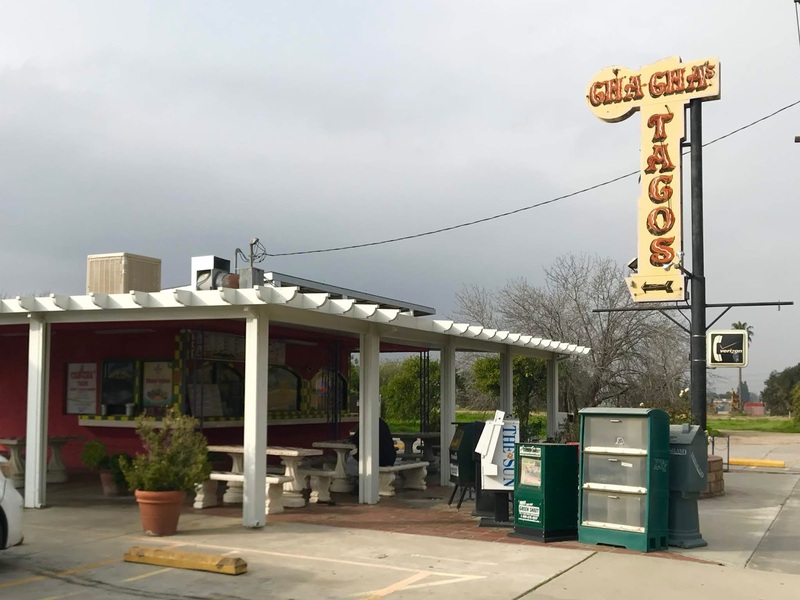 Cha Cha Tacos in front of the RV park. There's supposed to be a break in the rain on Friday morning. We'll hunker down here for Thursday and hit the road when it lets up. RV Waste Handling - Yesterday I shared our bathroom facilities. What happens to water from the sink and toilet? Our rental Coachman Leprechaun RV has two holding tanks. The one for black water from the toilet holds 22 gallons. The other for gray water from the sinks and the shower holds 28 gallons. Many RV sites have a sewer connection, or you can stop at a public or private RV dump station. Connected to services including the large black hose to the sewer. We've emptied our tanks twice. You wait until they are 3/4 full for enough gravity pressure to empty the contents through the large flexible hose. Black water goes first followed by gray water so it can flush out the hose. Fresh water finishes the cleaning process before storing the hose in an exterior compartment. Thursday, January 31 -- Got up before 8:00 as usual but we didn't need to go anywhere today. 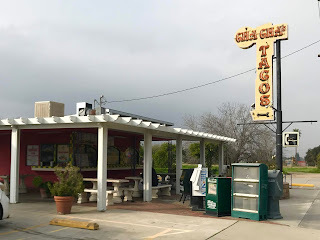 I went back to Cha Cha's Tacos and brought back our breakfast. Wayne did have huevos rancheros and I got a machaca breakfast burrito. Keeping up with my journal in addition to my blog. Yesterday I had time to sit out in the warmth to get caught up in my journal. 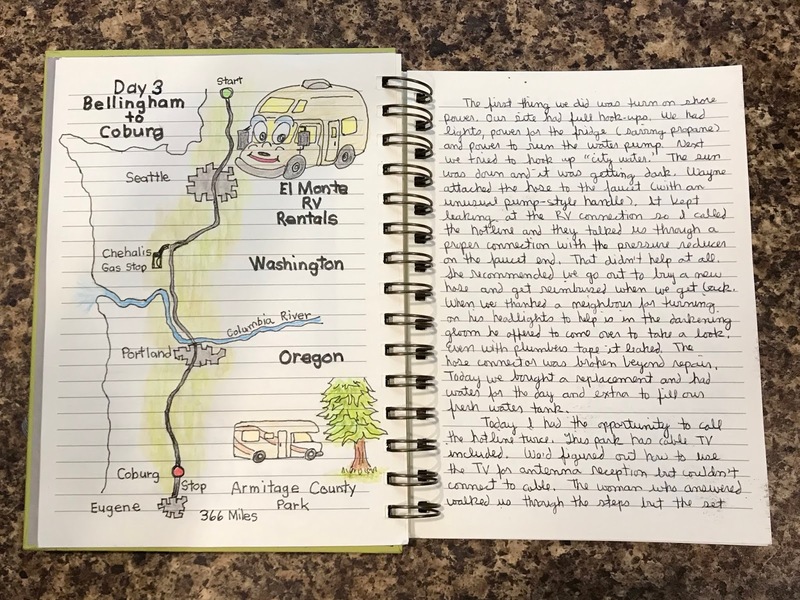 In addition to this blog, I'm keeping a written record of our trip and I'm using my new graphic pens and watercolour pencils to illustrate our travels. Thank you to the Comox Valley Art Council's 30-day drawing challenge for getting me inspired. A page from my illustrated trip journal. We used our day off to listen to the rain and thunder, read, write, watch TV and take showers here at the Mission RV Park. I'm so impressed with this small, friendly, well kept place to stay. If you are traveling by RV in the area I highly recommend it. Be sure to call ahead in all seasons. It's a popular spot for long-term residents. Friday, February 1 -- The weatherman was right. The rain stopped Thursday in the early evening. 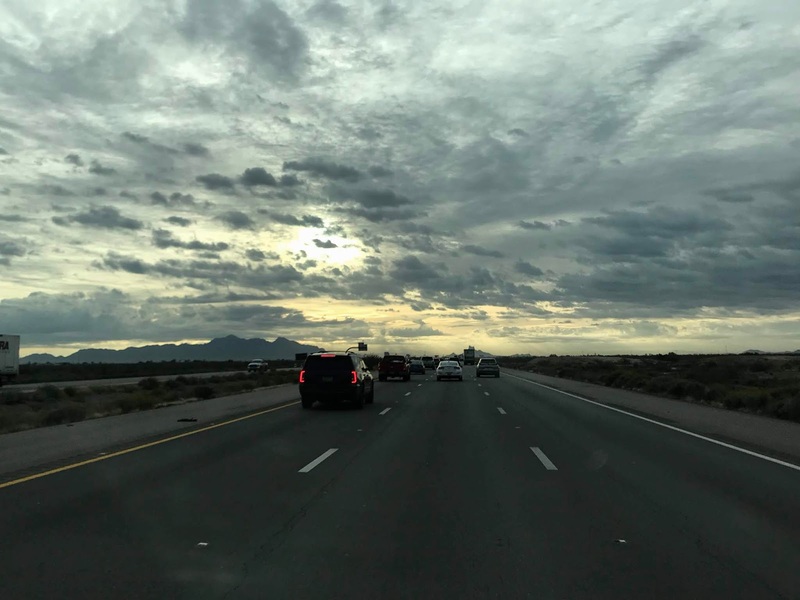 We got up early to get to Arizona during a short good weather window before the next storm arrives. 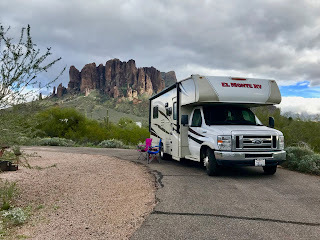 We left the Mission RV Park by 8:00. 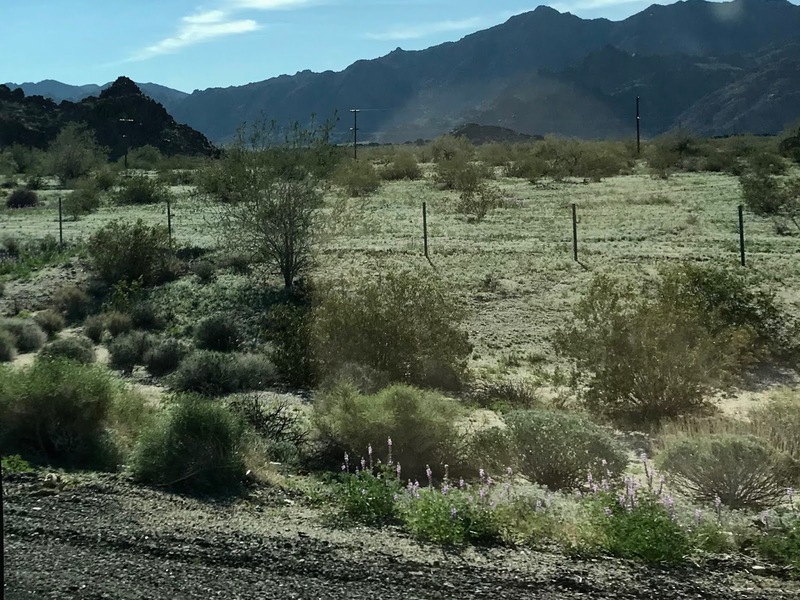 Lupine starting to bloom along the road near Chiriaco Summit, CA. 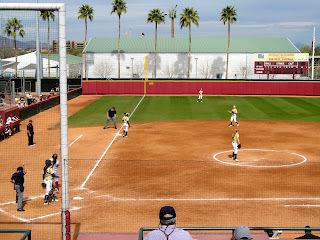 We were one block from I-10 so that was our route to Phoenix. The trip was 365 miles in total so we stopped about half way in Blythe for gas and a stretch. We stopped again in Goodyear for another stretch, so went ahead and got more gas. You can never have too much. Crossing the Colorado River into Arizona. 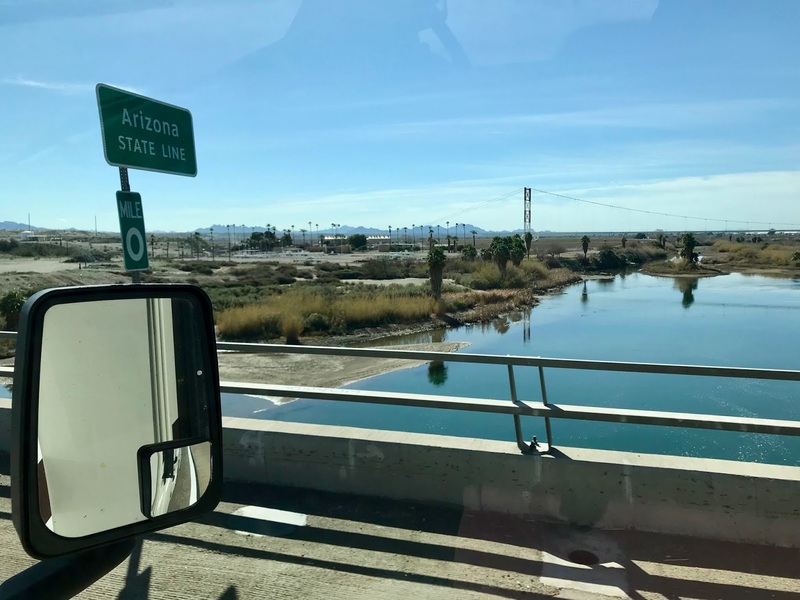 At Phoenix we turned south, continuing on I-10 to Casa Grande. 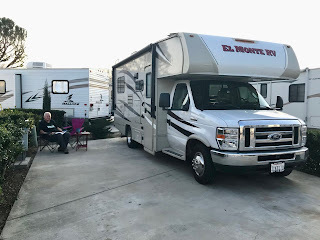 We picked the Fiesta Grande RV Resort because it was near restaurants. We can cook, but Wayne and I enjoy eating out once in a while. Well, maybe more than once in a while. It's been three times already this trip. We walked next door to the Thirsty Donkey. They have a unique lineup of 40 craft beer taps. You get a bracelet to make your selections and pay by the ounce. I was able to sample three beers for $8.00. Yellow roadside flowers near Salome, AZ. The Fiesta Grande is a mix of small mobile homes, seasonal RVers and a few overnighters like us. It's 55+ age restricted. That's common here in Arizona. We don't have cable TV or Internet so I'm using my iPad's hotspot. Then we are going to watch a Netfix movie downloaded to Wayne's iPad. Tough life! Site 33 at the Fiesta Grande RV Resort. Saturday, February 2 -- Today we left the Fiesta Grande RV Resort in Casa Grande by 8:00. On the way out we had to drop our Guest Badges (we don't need no stinkin' badges - just kidding) at the office. 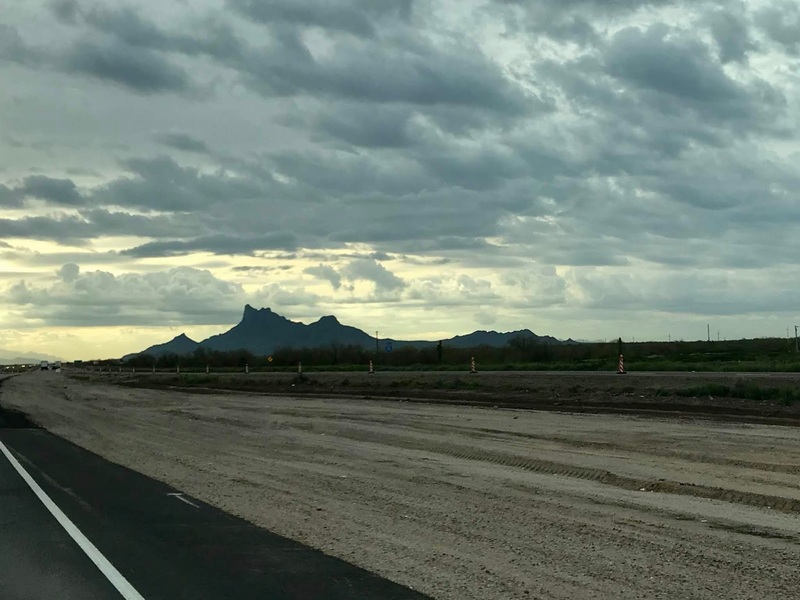 Today was a short driving day, only 84 miles south to the Pima County Fairgrounds just south of Tucson. Heading into the sunrise going towards Tucson. On the way we stopped at McDonald's for breakfast. We used Google to check and found an adjacent dirt parking area where our RV would fit. 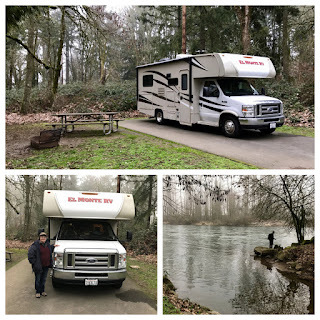 We wanted to stop at the Pichaco Peak State Park campground for the night, but they were already full. They have 85 sites with power and water. Maybe next time. 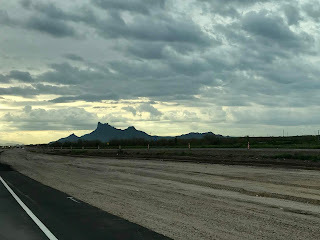 Distinctive Pichaco Peak in the distance. 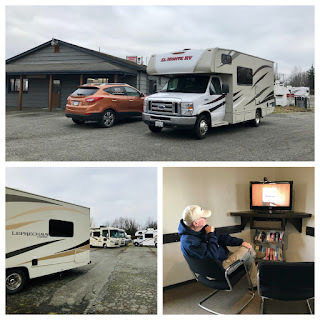 It's amazing, there are 362 RV sites here at the Fairgrounds with full hookups plus free wifi. The only thing missing is cable TV, but with Internet we can watch it on our laptops or iPads. Some sites are in a grove of trees but most are side-by-side on gravel. Our spot at the Pima County Fairgrounds. It doesn't sound exciting, but it's unique and interesting in its own way. There are new bathrooms and showers, and the older ones are spotless. We'd come here again for sure. With our Good Sam membership it was $58 for two nights. They don't take reservations, but even during this busy season they aren't full. 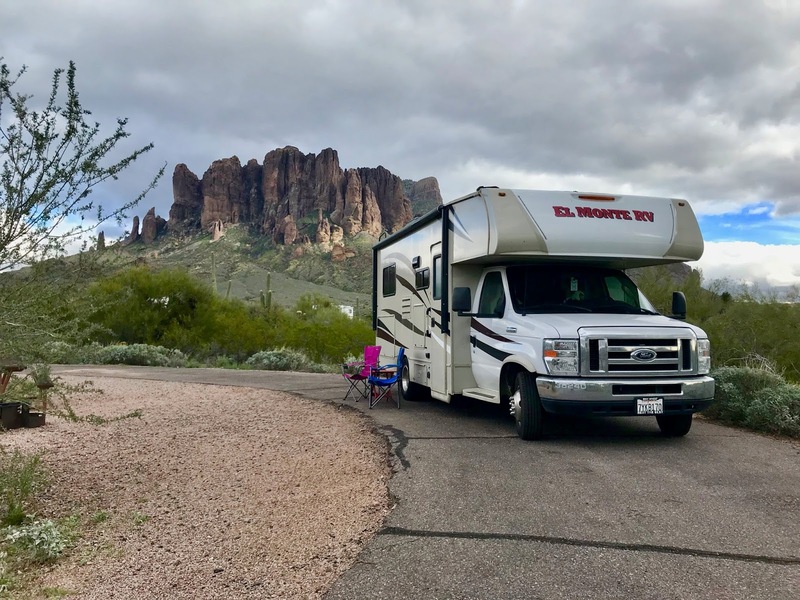 The reason we came to the fairgrounds was for the Tucson RV Show sponsored by La Mesa RV. 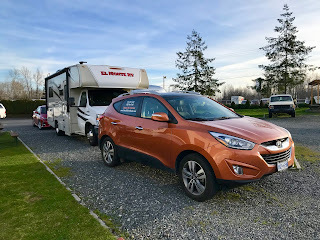 We've been having so much fun we may purchase an RV at some point in time. We don't know if it will be used or new, but we thought it would be fun to check things out. 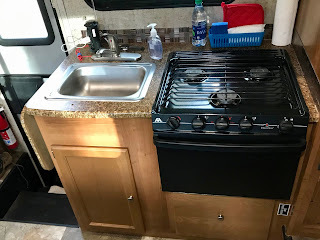 RV Hookups - RVs are built with service connections for water, electricity and sewer. At parks you find a variety of hookup configurations. Some campgrounds have none. That's called dry camping. 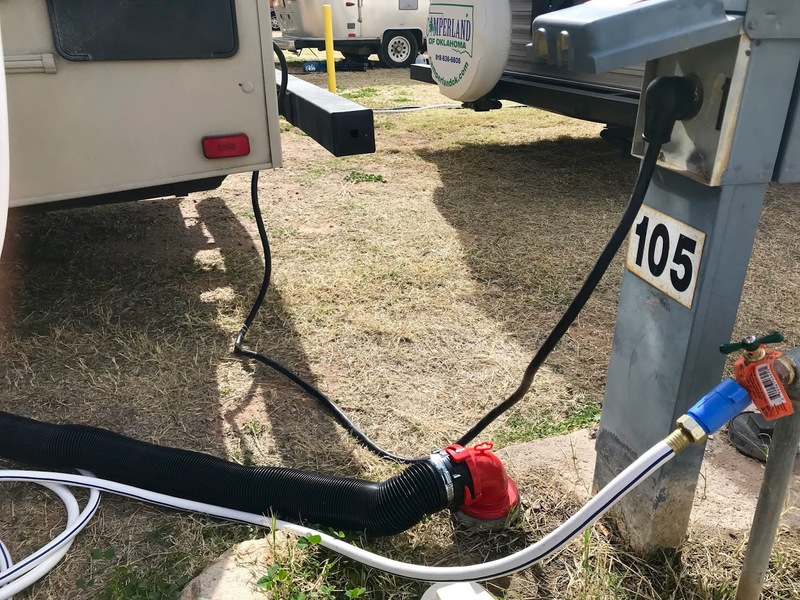 RVs have fresh water tanks, generators and batteries for power, and store sewage in holding tanks. Partial hookups include electricity and water. Full hookups add sewer service. Our power, water and sewer connections. Some public campgrounds have partial and full hookups for RVs. This way you can get out and enjoy nature with city comforts. 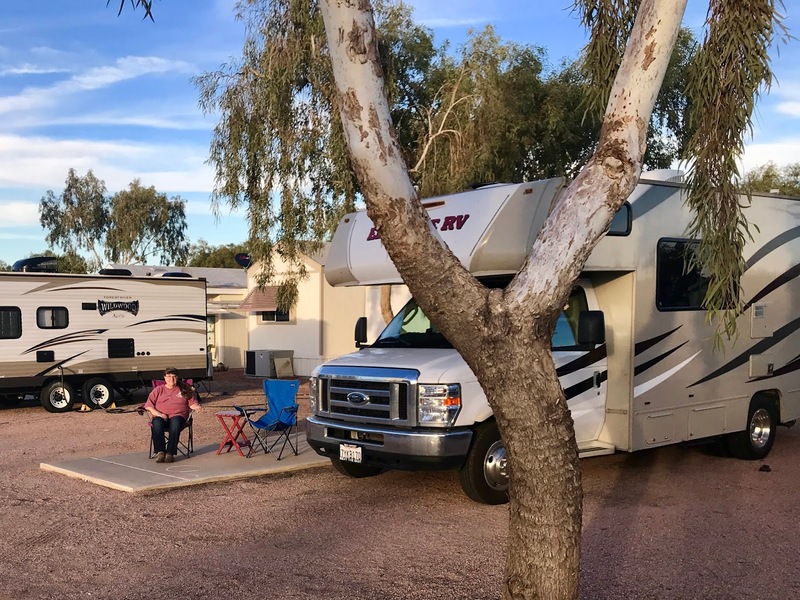 Almost all private RV parks and resorts offer full hookups. And to be competitive, they add Internet and cable TV. 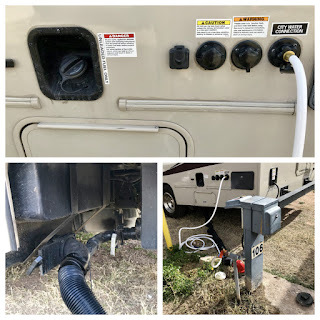 RV connections are standardized on the left or port side. You drive through or back in to the service point. 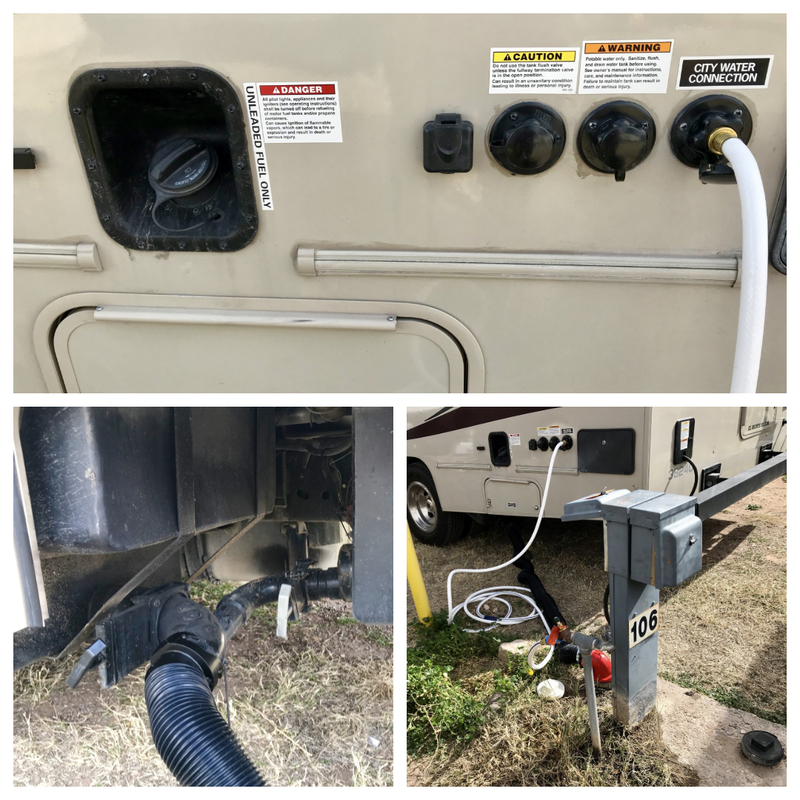 The top picture is the left side of our RV with the connections. From right to left are: 1) a direct connection to city water, 2) a port to fill the RV's fresh water tank, 3) a toilet clean-out port (for emergencies), and 4) the cable TV connection. On the lower left is our sewer hose connection to the holding tanks. On the lower right is the service access point.